Easy black bottom cupcakes with a box mix. 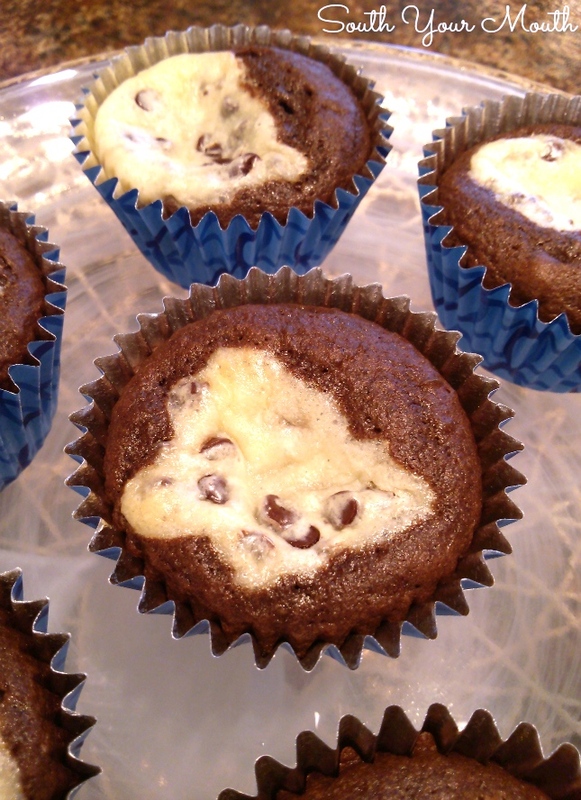 Chocolate cupcakes filled with chocolate chip cheesecake filling. I remember my mama making these when I was a kid. And there was something mysterious about them to me. I have no idea why. Maybe the name? Or that she seemed to enjoy them more than most other desserts. Like it was some secret woman thing. Because they didn't have sprinkles or mounds of icing or cherries on top or flaming sparklers stuck in them, I didn't pay them too much attention. And since they weren't overly sweet, I don’t remember begging for seconds. But I was kid. What did I know. Now? Now as an adult, I totally get it. They’re not overly sweet – in the best way. The chocolate cake is rich and dark and centered in the middle is a dollop of chocolate chip cheesecake. I think it is a woman thing. Or I thought. I thought these would be mine (all mine!) and that Husband and the onions would pay them no mind but I was wrong, wrong, wrong. Husband has left little blue liners all over the house. Because he really doesn't know where the trash can is evidently. Brutus, who is the pickiest eater, who has declared many times he doesn't like cheesecake was putting these down like a pro. I thought I’d put the skids to my rapidly declining stash of cupcakes by telling him, “Hey Brutus, you know how you say you don’t like cheesecake? Well, guess what’s in the middle of these cupcakes?” To which he said, “Well, I guess I like cheesecake now.” Grrr. Anyway, I decided to cheat and use cake mix. Because it’s easier and because my homemade recipe never has enough batter for all the cream cheese mixture (and doubling it would make too much). To add to the dark and mysterious side of things, I used strong black coffee instead of water but you don’t have to. Combine cream cheese, egg, salt, vanilla extract and sugar in a medium bowl and beat with an electric mixer until smooth and creamy. Stir in chocolate chips; set aside. Prepare cake batter per manufacturer’s instructions substituting black coffee for water. Place cupcake liners in cupcake/muffin pan and spray lightly with cooking spray. Fill liners 1/3 full with cake batter. Dollop 1 heaping tablespoon of cream cheese mixture onto cake batter (don’t press cream cheese mixture into cake batter). Bake at 350 degrees for 20 minutes or until toothpick inserted into cake comes out clean. Cool to room temperature then refrigerate in an air-tight container. These are really good; I haven't made them in years! Thanks for a great reminder! What an awesome idea to use cake mix! I've been making a more complicated version of treat for years, so am thrilled to find an easier way. Pinning! Thanks much for sharing at Weekend Potluck. We love your recipes so please keep coming back. I use a brownie mix, as opposed to using cake mix, because I don't really care for the chocolate in cake mixes.